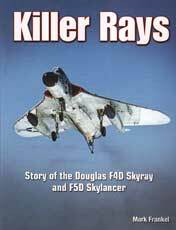 Killer Rays is the definitive work on the history of the U.S. Navy's only operational delta-wing aircraft, the revolutionary Douglas F4D Skyray, and its more advanced variant, the F5D Skylancer. Author Mark Frankel unlocks secrets of delta-wing design and covers the intense rivalry between the Navy's F4D and Air Force F-102 in the 1950s. This book chronicles the development of the Skyray from concept to first prototype, flight testing, carrier qualifications, and operational history. It also explains how initial engine problems nearly caused the failure of the F4D, and how it was ultimately saved. The author accessed a wealth of Douglas Aircraft photos, models, artwork, engineering drawings, and related material, including transcripts of conversations with Chief Designer Ed Heinemann and Configuration Engineer R.G. Smith. As a result, Killer Rays covers in vivid detail all aspects of F4D production, flight testing, world speed and time-to-climb records, plus new, never-before-seen aspects of NASA F5D operations, giving the reader the inside story on two significant Cold War U.S. Navy interceptor designs.